A sprawling three-and-a-half-acre private enclave on Miami Beach's famed Collins Avenue, The Miami Beach Edition is a unique, intricately designed oceanfront complex offering pretty much everything you could even conjure up — dining, nightlife, socializing, recreation, culture and even meeting space for work — all under one roof. 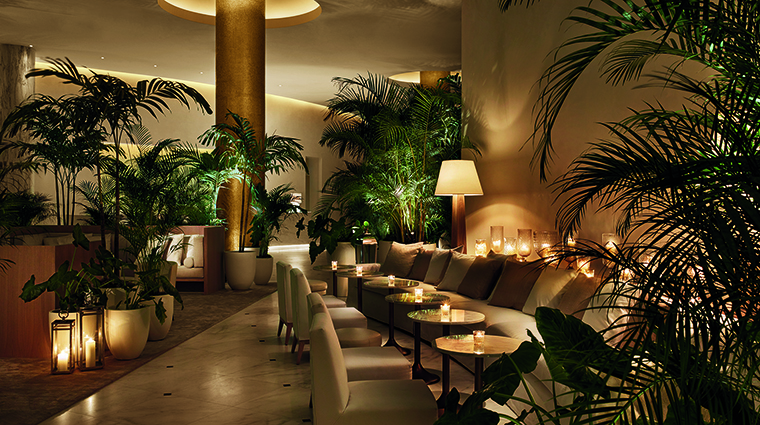 Celebrity hotelier Ian Schrager succeeds in his vision to transform the historic mid-century hotel into a modern-day resort. The Edition has 294 guest rooms and suites, 28 private bungalows, and a rooftop penthouse; outstanding dining options by celebrity chef Jean-Georges Vongerichten; two pools with outdoor bars; 70,000 square feet of semi-private beachfront; dramatic private event and meeting spaces; and a high-end spa and lounge. Wait — there’s more: the full-on entertainment arena features a bowling alley, an ice-skating rink and a nightclub. 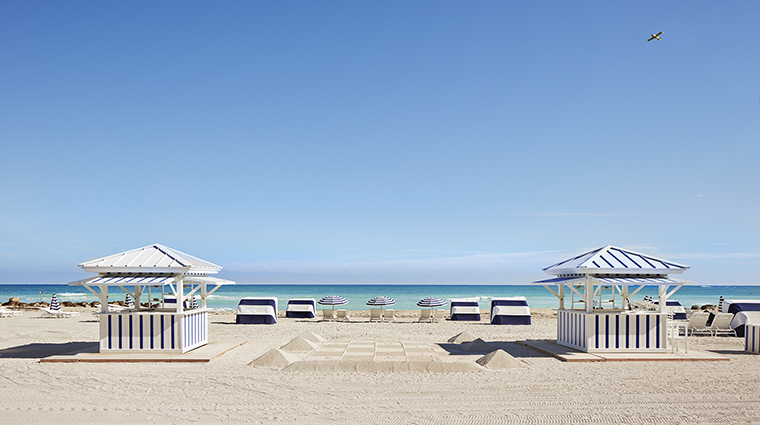 There's little reason to leave except, of course, the lively Miami Beach scene just outside the hotel’s front doors. 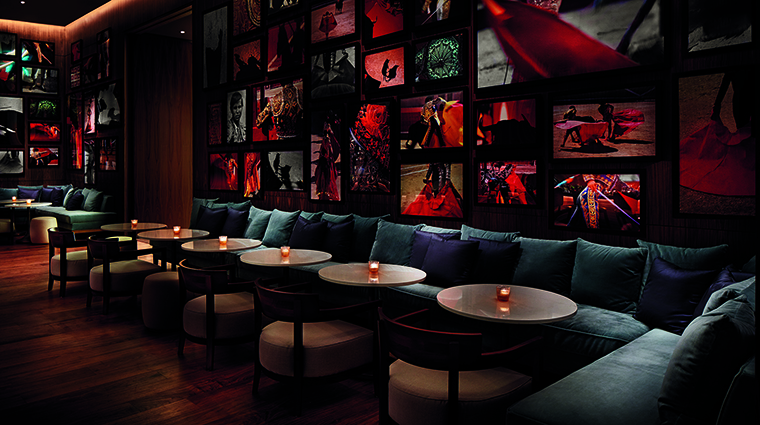 Guests are greeted with a curated selection of up-tempo Latin music plays in the background while a warm, friendly staff awaits at every turn. 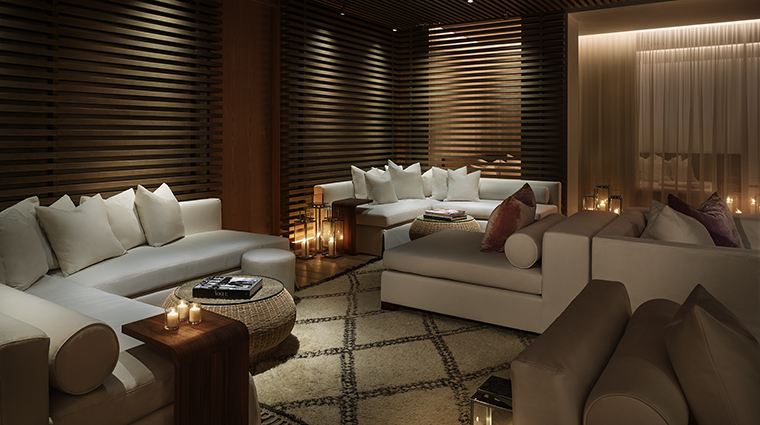 The Edition’s sophisticated approach to modern luxury is at once elegant and casual, and always with a sense of informal glamour. It's all barefoot-chic here, from the moment you step into the grandiose lobby with its pristine white marble floors, tall ceilings, gold-tiled columns and ocean-view bar (a rarity on Miami Beach). A signature scent wafts through the air, too. The Edition is set in the preserved shell of a historic hotel (the Seville) built in 1955 by architect Melvin Grossman. 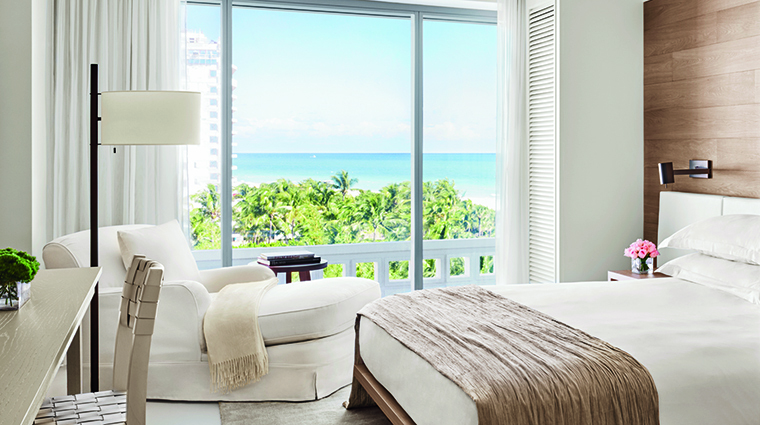 Despite its modern vibe, the Miami hotel goes to great lengths to pay homage to its storied past. Many of the Seville's details remain throughout the resort, including the original "Seville" sign, the restaurant Matador Room’s original chandelier and theatrical sunken middle section, and the fully restored swimming pool complete with period diving board. The multi-dimensional entertainment hub, named Basement, includes a nightclub a la Studio 54, a four-lane bowling alley and a 1,785-square-foot ice-skating rink — all outfitted with state-of-the art sound and dramatic lighting by concert lighting specialist Patrick Woodroffe. 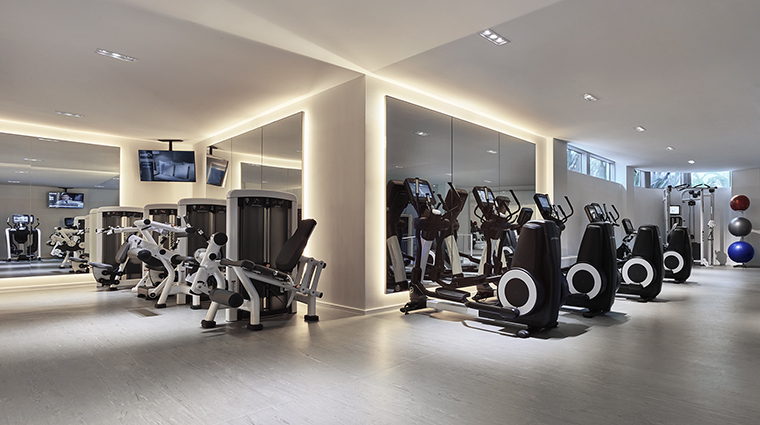 Business travelers will appreciate The Forum, a 10,000-square-foot conference center indoor event space, among the largest of its kind in Miami Beach. 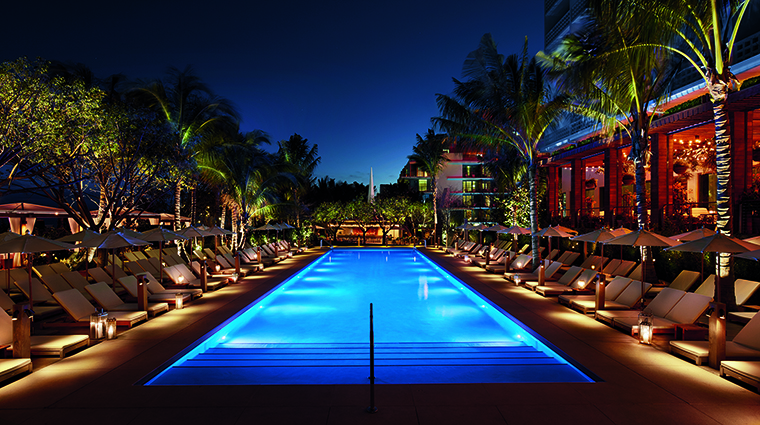 The Miami pool scene is alive and thriving here also, with two pools surrounded by loungers and private cabanas. The upper-level bungalows have a roof deck and plunge pool. 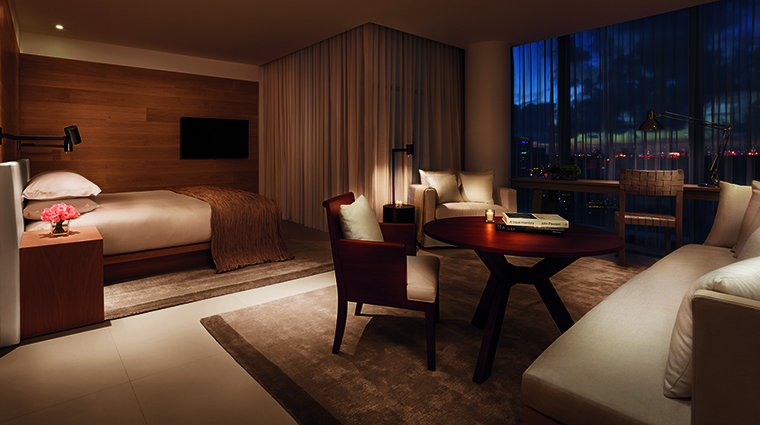 Generous and elegant in their design, guest rooms feature light oak-paneled walls and warm wood finishes, ivory porcelain-slab tiled bathrooms with sliding glass doors. Many of the rooms have beachfront views from a private terrace. All rooms are decked out with custom furnishings, including an extra-long bleached-oak desk, a white-linen chaise lounge and hand-tufted silk-and-wool area rug. One- and two-level bungalows provide separate bedroom, dining area and living room spaces, a balcony. 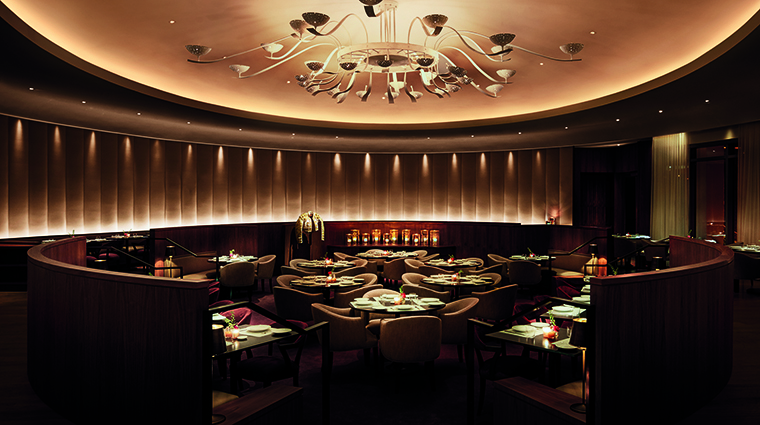 When it comes to dining, Vongerichten's Matador Room serves a splendid Latin-inspired menu. The open-air café, Market at Edition, is part patisserie, part boulangerie and part salumeria, and is open around the clock. For alfresco dining, Tropicale, set in the original landmarked Sundial restaurant and bar, provides light bites and cocktails to enjoy poolside or beachside, or in the sandbox tucked behind the larger pool.